Do not place the PC sheets on the cement floor or against the cement wall. Frames for PC sheets should be clean, and the surface of the inserting grooves should be flat. Select suitable thickness that allows bending radius of the PC sheets. Reserve space for expansion and watch the depth while inserting the sheets. Use appropriate silicone or gasket material for tamping. 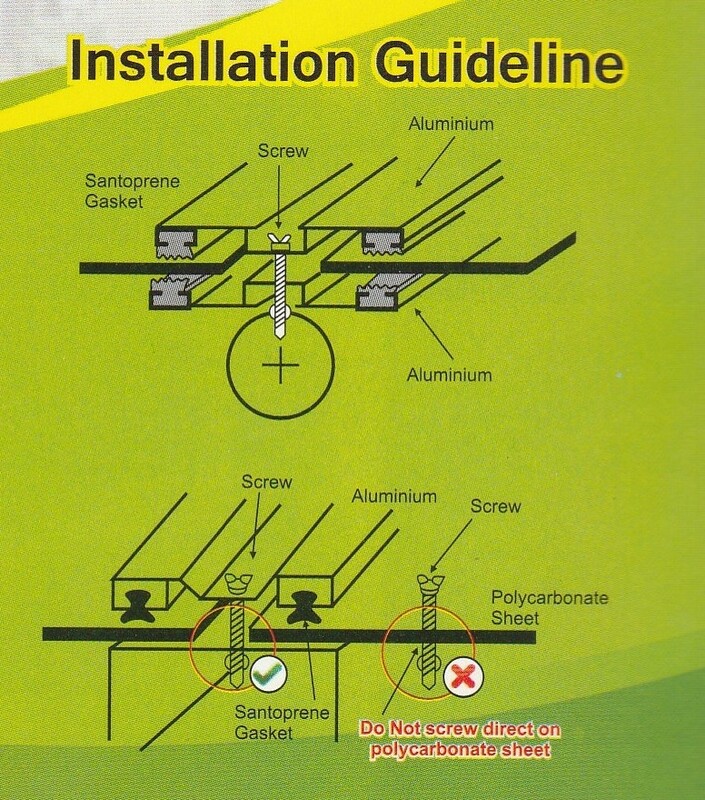 Do not use any PVC materials. Use electric tools (saw blade made of tungsten carbide) for cutting. Make sure to fix the pc sheets to avoid vibration when cutting. Do not peel off protective films when cutting. Mark on protective films only. If it is necessary to mark on the sheets, use crayons, instead of using sharp pens. Do not peel off protective films until the installation is completed. Cut off protective films for 5 to 10mm before inserting PC sheets to the support frame, because the protective films would cause inefficient adhesive between tamping and PC sheets. Since the expansion and contraction degree of PC sheets, is different from that of medal frames, as well as PC sheets are flexible and taking air pressure, therefore, appropriate insertion, reserving space for expansion and shrink because of temperature changes, and choosing suitable thickness of PC sheets are necessary. When PC sheets are installed outdoors or where there is a temperature difference over±8°C, all rivet holes should be reamed to reserve space for expansion and contraction. Usually, the holes should be larger than that of the bolt or rivet stems by 1/16". If the hole is 24", the reserved space must be 1/8"; if the hole is 6", the reserved space must be 1/32". All rivets must be made of aluminum and "Thread-in" screws should not be used. Fill up the holes, and cover the exposed portion with silicone compound to prevent detergents permeating which brings damage to pc sheets, and avoid gradual cracks. Rivet heads should be larger than the stems by 1.5- 2.0 times. Use gaskets or washers to avoid the rivet heads touching pc sheets, and reduce the pressure. Do not screw into too tightly. Do not use gaskets made of PVC. To be supportive, put metal straps on both long and short sides and reserve space for expansion and contraction. Do not clean PC sheets with benzene, gasoline, acetone, or tetra chloromethane. In order to avoid cracks, do not clean PC sheets with detergent under strong sunlight or when bending work is applied. Use neutral detergents to wipe off dust and remove all stains on the surface of PC sheets with soft cloth or sponge; then wash the sheets; at last, dry with soft cloth. Notes: Consider the thermal expansion due to seasonal temperature fluctuation, the aperture should be 50% larger than the diameter of the screw. 35, Jalan Utama 2/7, Taman Perindustrian Puchong Utama, 47100 Puchong, Selangor, Malaysia.